Savannas -- tropical areas where scattered tree cover allows grasses to grow -- cover roughly a quarter of Australia. Distinct wet and dry seasons define the savanna, which would be a rainforest if the heavy precipitation of the wet season were evenly distributed throughout the year. Extending across the continent's northern tier, parts of Australia's savannas, which encompass grasslands with virtually no trees and grassy woodlands, rival rainforests in their biological diversity. Rodents, insect-eating bats -- such as the inland forest bat -- and marsupials account for most of the mammal species found in Australia's savannas. Often seen in large groups are a type of bat known as flying foxes that play a key role as pollinators. The region's population of marsupials -- mammals that develop outside the uterus, in an external pouch -- includes the red kangaroo, the large antilopine wallaroo and the agile wallaby. 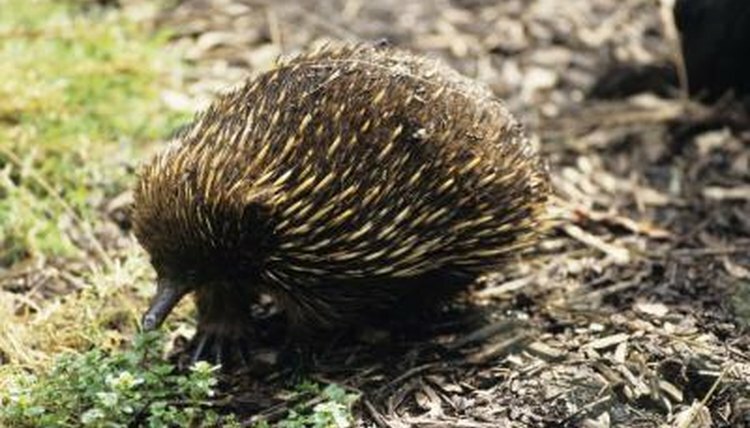 The Australian savanna is also home to one type of monotreme, or egg-laying mammal: the short-beaked echidna. Australia's savannas host 55 species of seed-eating birds, including parrots, pigeons, quails and 14 species of finches. At least 13 of these seed-consuming birds are endemic, meaning they are found nowhere else. Endemic species include the gouldian finch, golden-shouldered parrot and the buff-breasted button-quail. Flocks of birds of prey known as black kites gravitate towards areas of the savanna where bush fires send insects and snakes scampering, a strategy also employed by the brown falcon. Other avian residents of the Australian savannas include two species of kookaburra and the emu, a nomadic, flightless bird second in height only to Africa's ostrich. Australia harbors two species of crocodile, the endemic freshwater crocodile and the saltwater crocodile, both of which inhabit bodies of water in the continent's tropical savannas. Contrary to what their names suggest, both species can be found in fresh and saltwater. After birds, lizards are the most abundant vertebrates in Australia's tropical grasslands. Species include the Kimberly rock monitor and the frilled lizard. Venomous snakes, like the eastern brown snake, as well as non-venomous species such as the black-headed python also inhabit the savanna. The overwhelming majority of amphibians in Australia's savannas, as well as the whole of the continent, are frogs. Most frog species native to the northern Australian savannas belong to the taxonomic families Hylidae and Myobatrachidae. Most commonly seen is the giant frog of the former family, which, like other members of the genus Cyclorana, burrows underground during the dry season. Another well-known member of this family is the common green tree frog. Species in the Myobatrachidae family include the scarlet-sided pobblebonk, which occurs along the entire coast of the state of Queensland.